Art Elements blog is hosting a Sunflower blog hop challenge today. Participants have all agreed to create jewelry or other art forms with a sunflower theme. I love sunflowers, so I hopped right in. I took this close-up photo of a sunflower I had in a floral arrangement I’d made. I love the streaks of reddish-brown on the yellow petals. 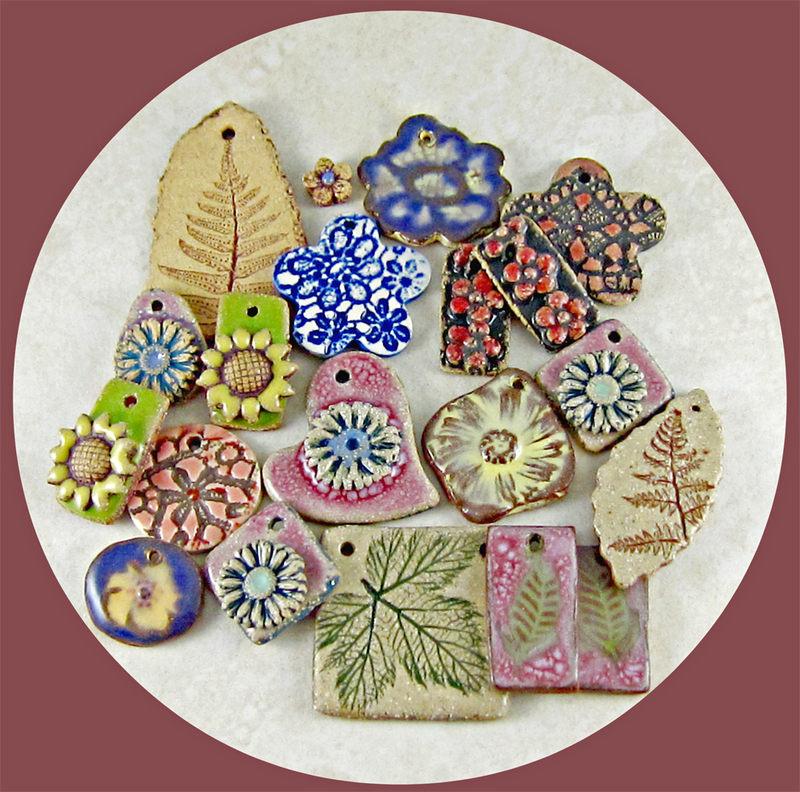 To achieve that effect on my ceramic pendants I layered two specific glazes. The top glaze crackles when layered over the reddish-brown glaze beneath, allowing some of that lower layer of color to bleed through. I was so pleased with this effect that I made a whole pile of sunflower pendants, just because I was having so much fun with them. As you can see, each one is a little different as I played with different aspects of the design. I made one pendant that was a bit larger the those above and which had a big enough hole to accommodate some leather. I used that pendant in my necklace for today’s challenge. 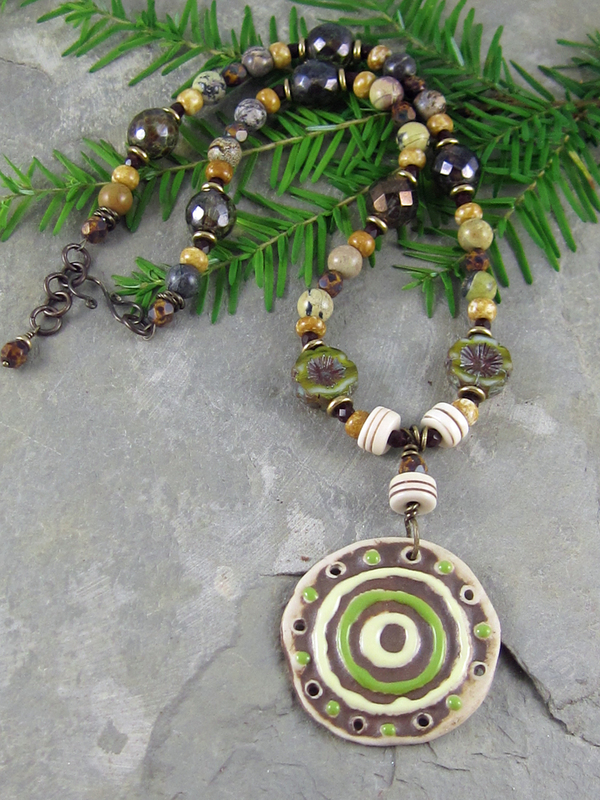 I attached the pendant to the leather with a simple larks head knot and above it I placed two hand enameled tubes that I believe were made by Mary Dodd. The leather then connects to some Terra Cast copper rings with a nice surface texture. 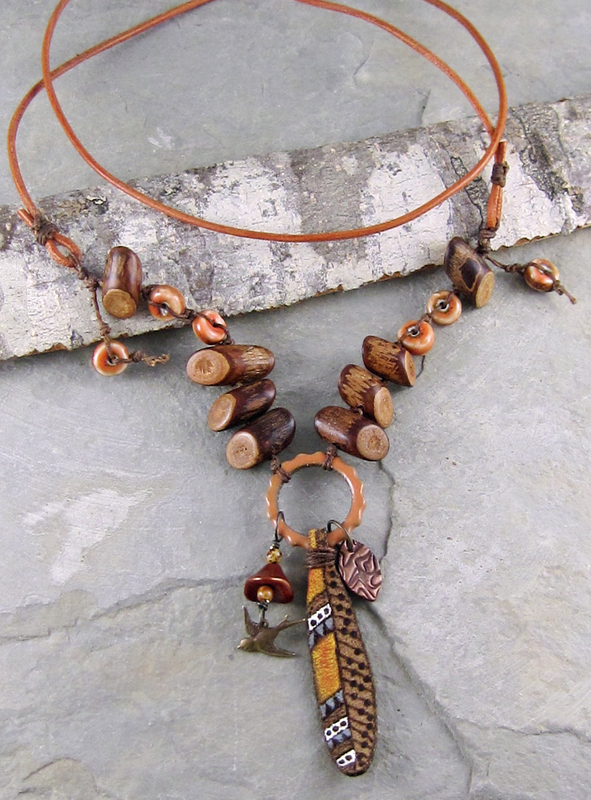 I love how the copper color echoes the browns in the pendant. 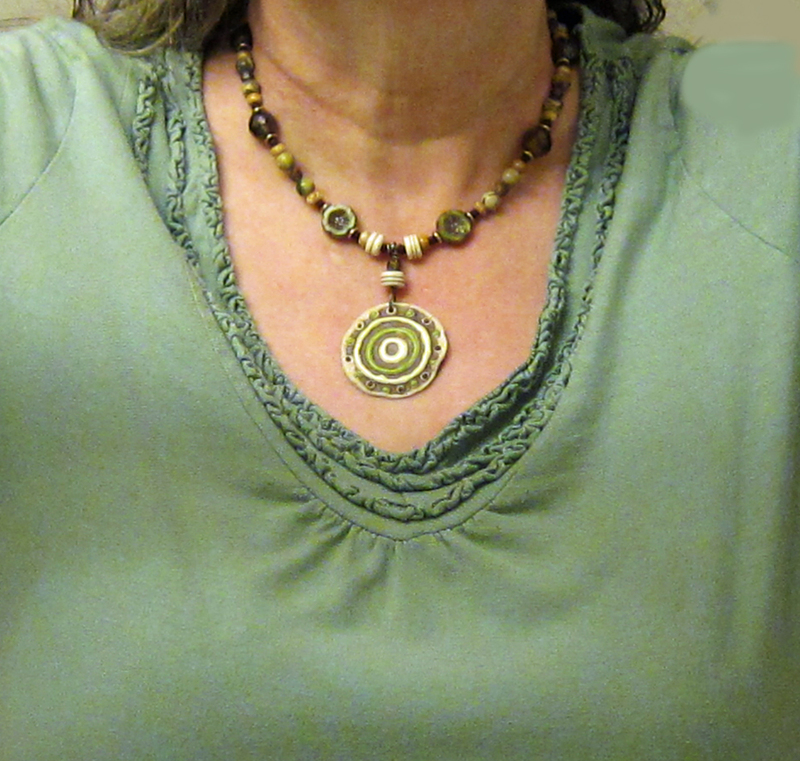 I added a short strand of vintage glass beads and peanut beads, that I suspended from the rings, as well. When worn, they drape just on top of the leather and end about an inch or so above the pendant . 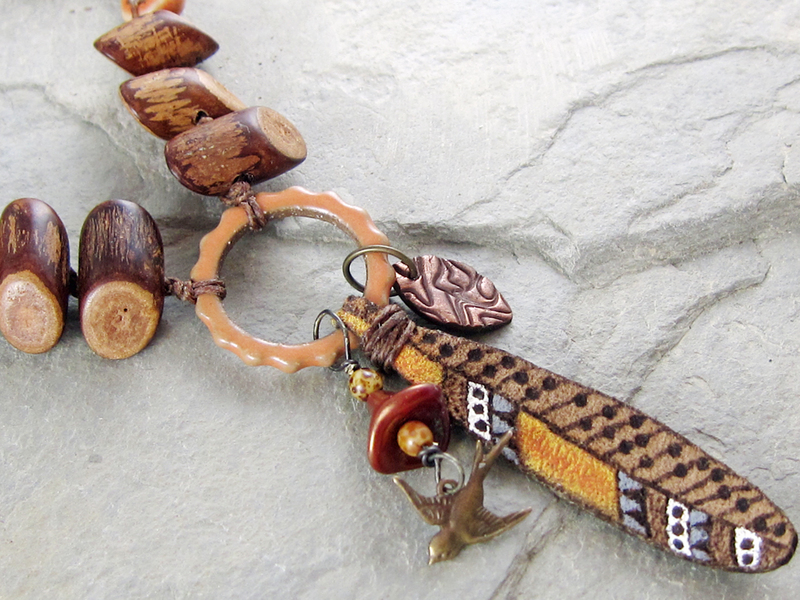 Leather cording finishes off the back of the necklace, which ends in a copper-colored lobster clasp. 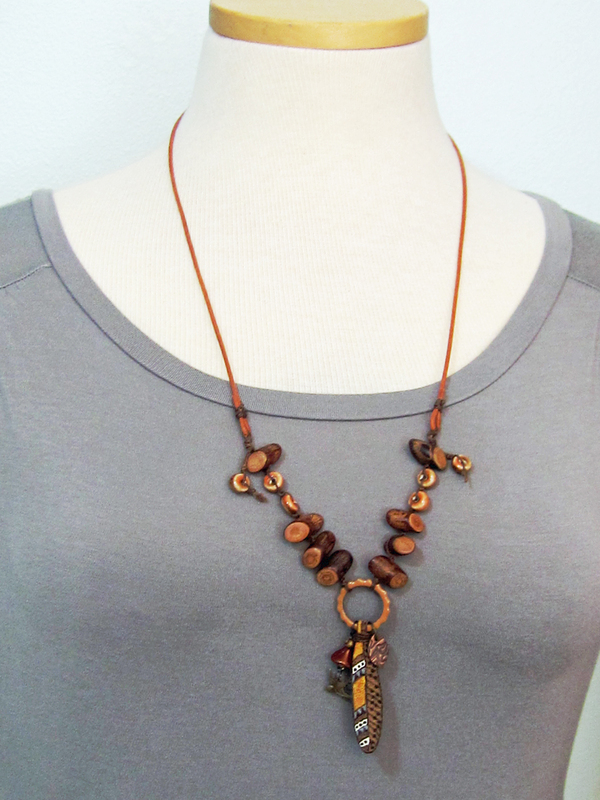 This is a nice long necklace, which I could have made without a clasp, because it slips easily over the head. I have one sunflower pendant listed on my website, but if you want more, just message me here or through my website. My thanks to Sue and to Art Elements for hosting this fun summer challenge. This is a blog hop, so be sure to share the love with all these other great artists! 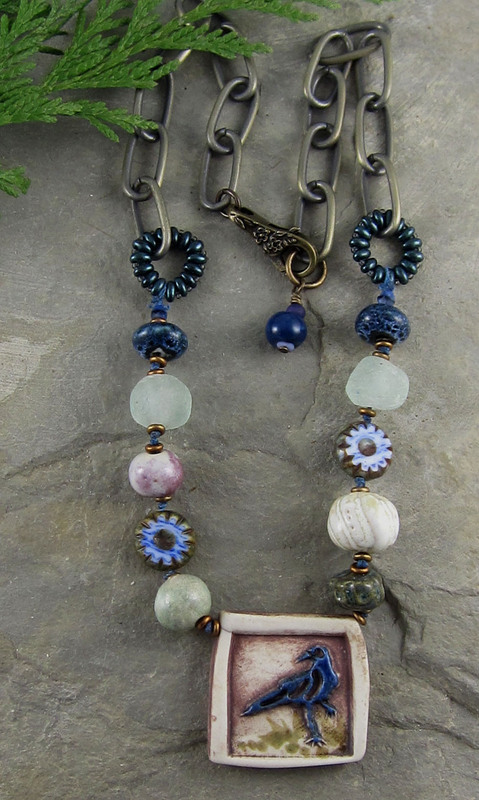 Towards the end of May, Sherri Stokey put out a challenge on the Love My Art Jewelry blog to design something in this color palette. I was inspired, although I didn’t play by the rules exactly. The necklace I designed is beachy and turquoise. I even included a starfish, however the necklace doesn’t have the neutral colors that Sherry included in her pretty color palette. My necklace just didn’t seem to want to develop in that direction. I’m still inspired by Sherri’s color palette though and I’d like to make some additional pieces of jewelry that adhere more closely to her colors. I made some ceramic clam shell pendants this weekend. I bisque fired them on Sunday, but they haven’t been glazed yet. Perhaps I’ll use one of the clam shells to design a necklace in tan, ecru, turquoise and teal. I’ll be sure to share further explorations with this theme. In the meantime, my Sea Star Necklace is available in my shop. 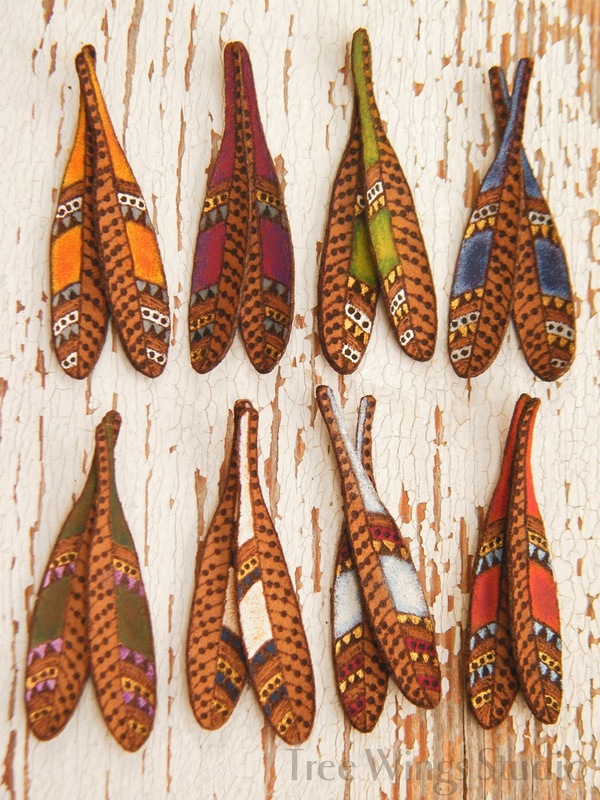 Our November component comes to us from Kristen Stevens of Beadwork By KAS. 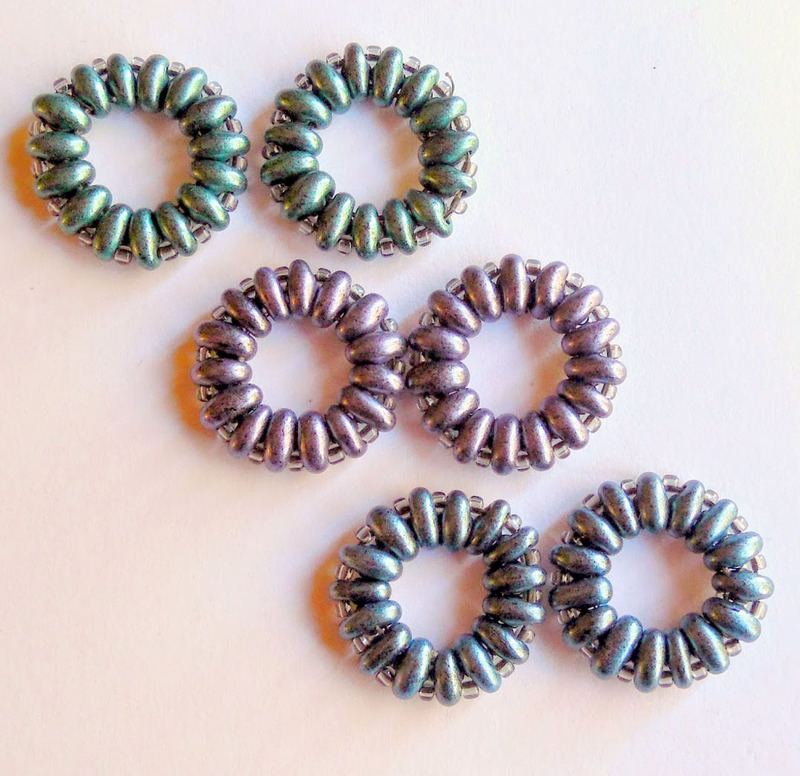 Kristen does amazing things with tiny beads, including these wonderful beaded links. This is actually the second time I have used Kristen links in this color, but I was delighted to give it a go another time! I made these earrings a couple of months ago and they are available in my shop. .I purposely picked the same color this month, because I really love it! 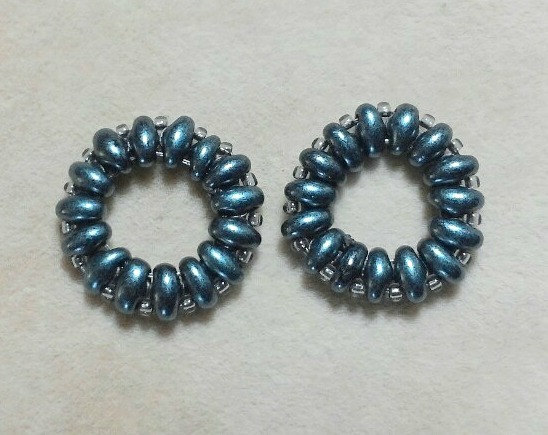 However, I didn’t want to make earrings again. I had this necklace started on my work table. I liked the front part of it, that you can see below, but I was dissatisfied with the back of the necklace. The blue raven pendant is by Oh! 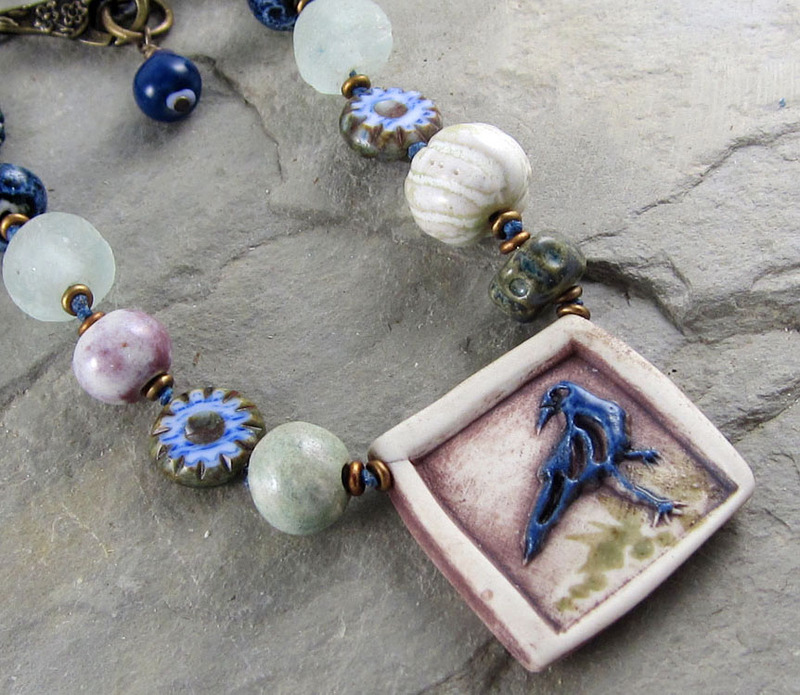 Sullivan Studio, the handmade ceramic beads are from Gaea and White Clover Kiln. 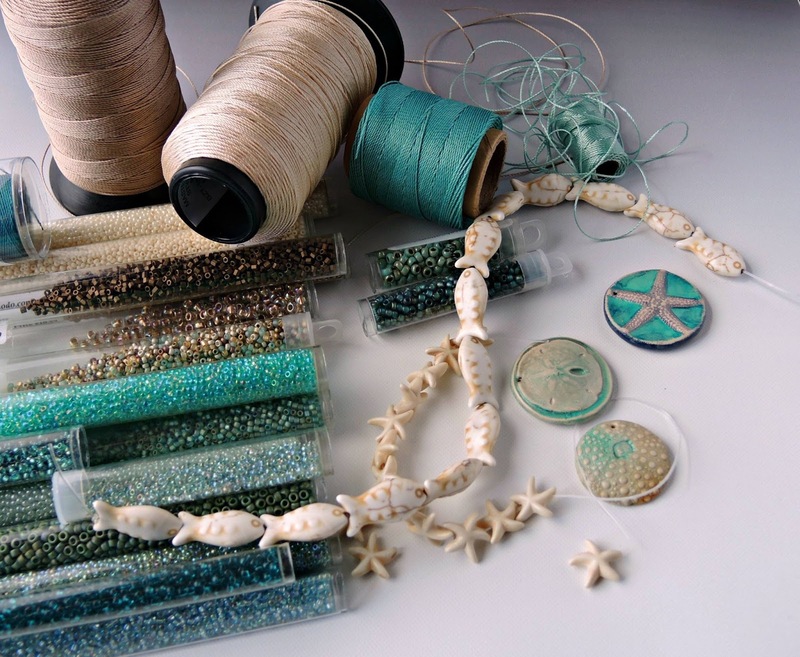 There are also some recycled glass beads and various other goodies that are all knotted on Irish waxed linen. When I saw the unfinished Blue Raven Necklace sitting on my table this week, I realized that Kristen’s beaded links would make a perfect transitional point from a beaded section of the necklace to chain in the back, and the colors were perfect. I love serendipity like that! So here’s my transformed necklace. I love it now! 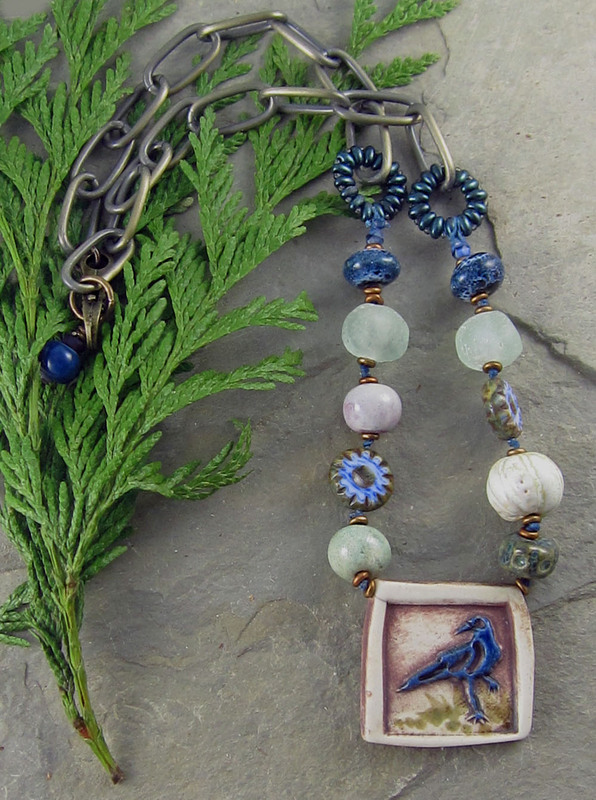 Due to Thanksgiving busyness and holiday jewelry show preparations, I haven’t had time to add the Blue Raven Necklace to my shop yet. But just leave a comment below or message me if you think you might be interested and I’ll fill you in on the details. 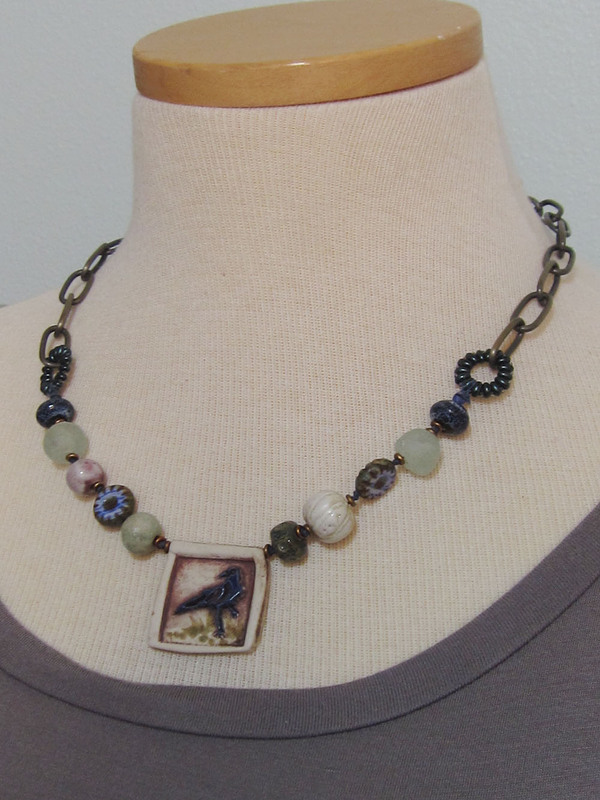 This is a blog hop, so I encourage you to check out what all the participants did with Kristen’s awesome beaded links. Once a month Art Jewelry Elements (AJE) hosts a giveaway and jewelry reveal. I am the hostess for June. 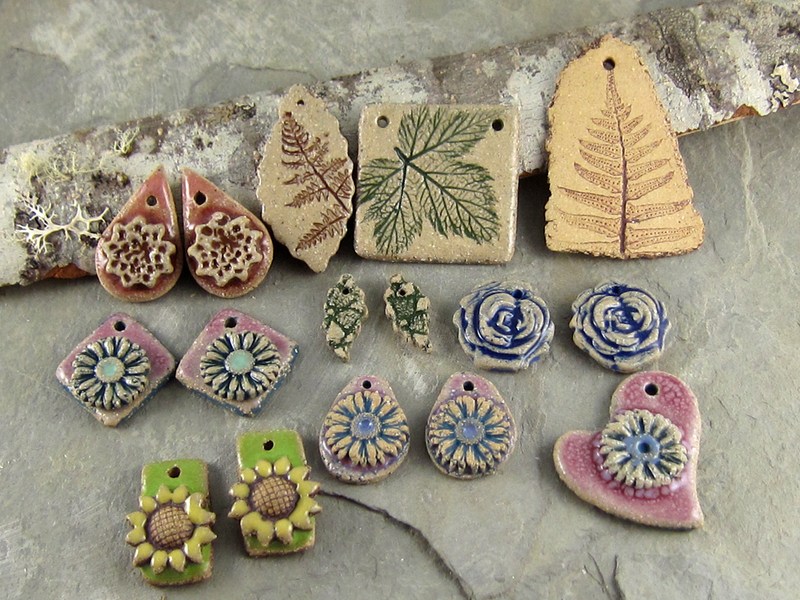 Members of the Art Jewelry Elements team, plus three guest artists were given one of my garden themed ceramic components to use in a jewelry design of their making. I can’t wait to see what everyone has created! 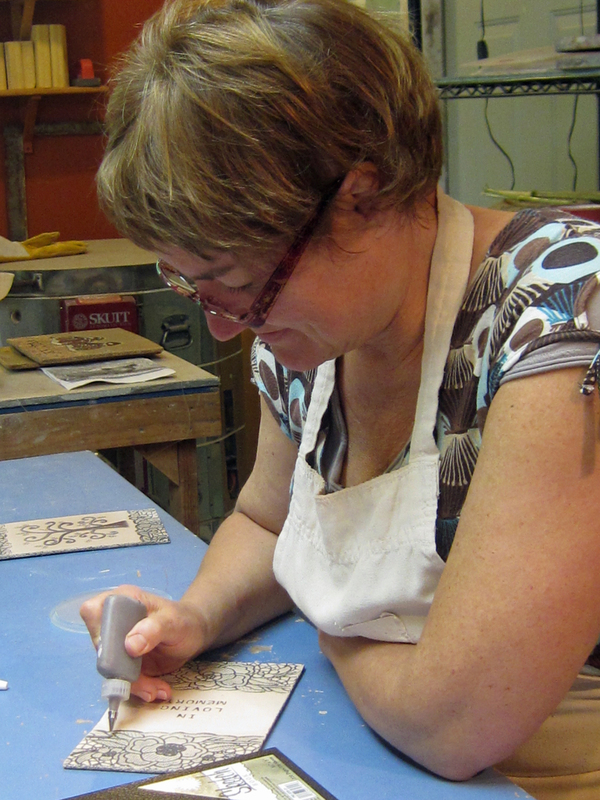 Marion at work on one of her custom stoneware book covers. 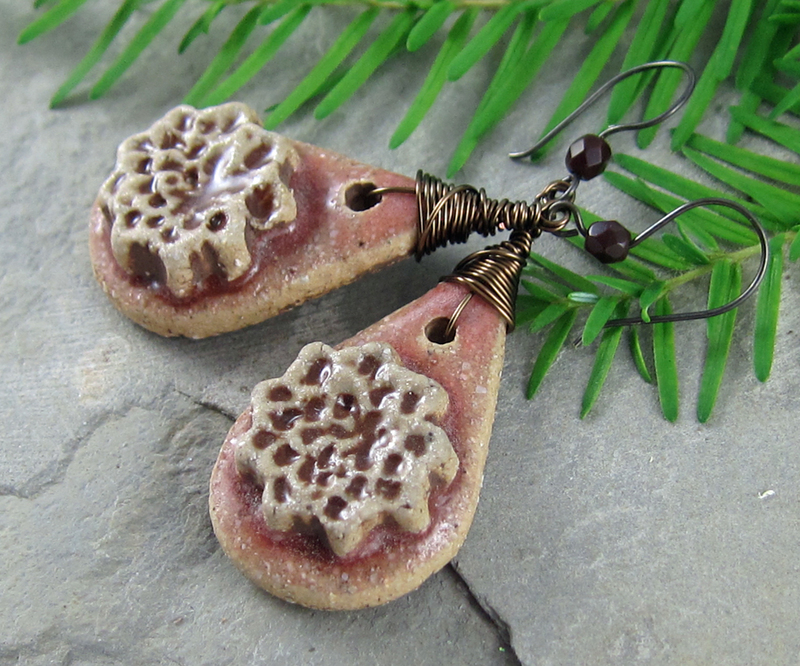 Marion picked out a pair of rustic teardrop flower charms and I made them into earrings for her. The earring charms were made in layers. 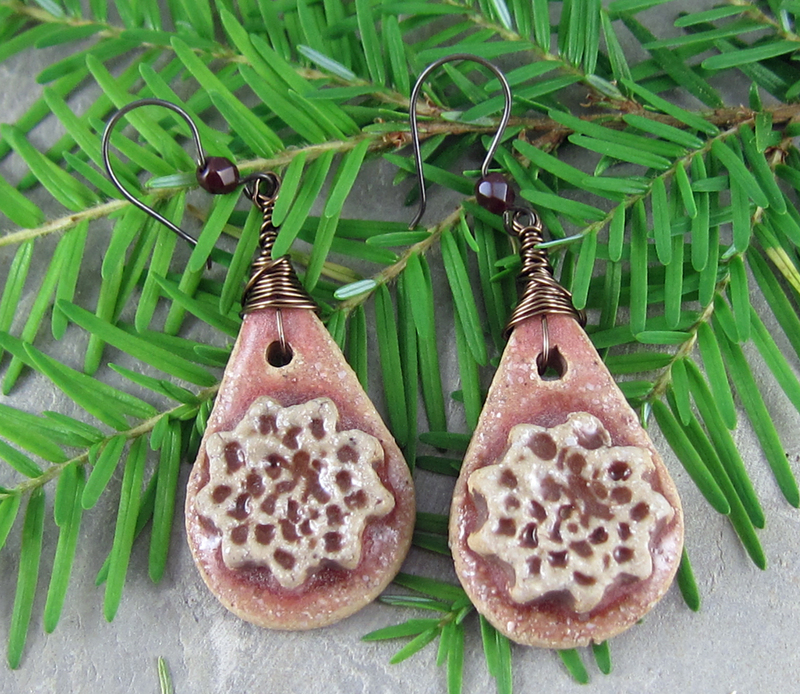 I learned how to make a clay “slip” that, when fired, permanently attached the flowers to the teardrop shape. 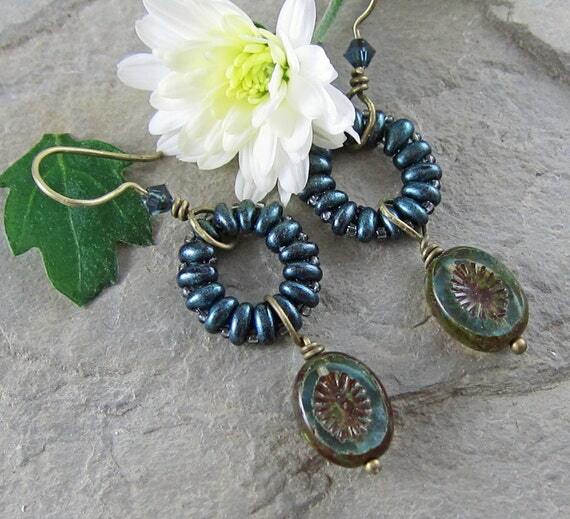 I did a rustic wire wrap and made my own ear wires with accent beads. Next up, I wanted to make a necklace for myself. It’s funny how infrequently I make something just for me. I’d been dreaming of getting my hands into clay for so long, that I decided I should make a necklace that would mark the realization of a dream come true. The medallion pendant was one of the first pieces I made and it was pretty much a collaborative effort between Marion and I. I love the colors in it and I know I will wear it a lot. 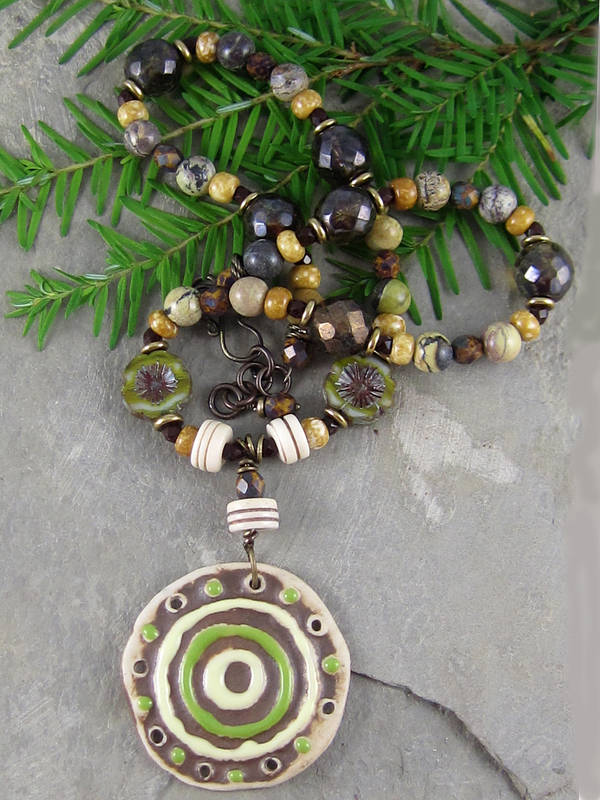 I highlighted the pendant with some bone colored beads and two gorgeous premium Czech glass flower beads. The rest of the necklace is made of serpentine, three sizes and colors of fire polish beads, some size 6 seed beads and brass spacer beads. It is adjustable, with a self-made clasp. Now comes the fun part! Follow the links below to visit all this month’s jewelry designers! Have fun!